We are proud Californians deeply committed to our state’s environmental legacy: resource protection, coastal and ocean management. But, like most Californians, we also firmly believe in the fundamental principle of private property rights — and the notion that one should not be allowed to wholly supplant the other. There must be a balance and the rule of law, not of mob behavior and bureaucratic overreach. Unfortunately, the opponents in the case have demonstrated little interest in the facts, the history of this land or the legal principles at stake. They’ve refused to collaborate and they’ve refused to negotiate. All they offer are threats and litigation and the cynical rhetoric of class warfare — when all they really want is to permanently and irreparably upset the balance between public access and private property rights in our state. The fact is the public had access but the opponents wanted a public fight, not a public solution. This issue has nothing to do with the environment which at Martin’s Beach needs protection, not more surfers. We are a nation of laws and specifically private property rights. We want the law to determine the issues at stake in the Martin’s Beach dispute, not the wants and self-promoting hoopla created by the Surfrider Foundation. The Surfriders and opponents have shown little respect for the law instead relying on lies and innuendo to make coercive comments like “we will shame you” or “we will get you” instead of following the law at least as clarified to date by Judge Buchwald in earlier rulings. The attitude of folks that want access has been one of entitlement and the tactics that they have used feel like blackmail. Contrary to perception the new owners voluntarily left the beach open even while losing substantial funds closing it selectively very much following a pattern that has been followed by prior owners for decades. The county arbitrarily, unfairly and unprovoked by any change in pattern of opening and closing of the beach as described in sworn testimony of the prior owners, demanded that decades of practice by prior owners be changed as to when the beach is open and that parking rates be changed to those in 1973. This is bureaucracy becoming overbearing and invasive on private property laws of the state and the country. Martin’s Beach has gone to great lengths to reach out to agencies and stakeholders but have not even been granted an audience or even to have a dialog. After years of trying we have not even received a hearing from the Coastal Commission. The strategy seems to not be of “public service by a public agency” but we will coerce with bureaucratic delays to pressure property owners to give up their rights. Surfriders, when offered a dialog if they acknowledged private property rights that Judge Buchwald has affirmed in his rulings, refused the invitation, preferring instead their coercive approach to blackmailing the new owners into giving in to their demands. They seem to prefer mob rule to state and federal law. Fact: The gate was not installed by new owners but rather the current gate was put up in 1950’s and other gates even earlier. Access control was thru a toll road per sworn testimony. No pedestrian access was allowed and only cars that paid a parking fee were permitted beginning in the early 1920’s. Before that there was a locking chain or cable across the road that was used when the property was closed, over 100 years ago. Fact: Per the sworn testimony from former owners, they ran it as a business and closed it for periods of time when it was not profitable or convenient to the family, especially and often in the winter. The gate has been closed on and off for over sixty years whenever (1) it did not make economic sense like in the winter (2) when it was inconvenient for them given other priorities, family needs or staffing (3) for private use; they testified in court that they used it as a business and opened it when it was profitable or convenient and to the extent there was parking available and there were no private events scheduled. The prior owners ran a business at Martin’s Beach. For any property owner it is their inherent right to start,close, continue or discontinue any business. That the question of law is being turned into a question of “what Surfriders want” is opportunistic. Fact: There was declining interest in the beach with maybe a couple or no cars on a typical day. Should the new owners lose hundreds of thousands of dollars a year to provide access to so few cars or have the State spend millions of dollars to acquire these rights for barely any use and for easy availability of many other beaches in the area? The road was used as a toll road as long as there was parking available with no pedestrian access. According to the formers owners’ sworn testimony, for a decade the interest in using the property by the public has been declining with fewer and fewer visitors. This has reduced the profitability of the family operation resulting in more frequent closures. According to the former owners under sworn testimony, on a good day you might see one or two surfers. And only when there was a south swell. It was a fishing beach but fish have declined and there are hardly any fish anymore. Through the years the beach access business definitely declined with fewer and fewer visitors. The real business of “public access thru their toll road” has been slipping for a long time. Mr. Deeney testified under oath that the business was in decline and it was one of the reasons they sold the beach. Fact: The new owners lost money trying to keep the beach open despite losing money. Parking fees did not even cover the cost of insurance. Should the owners of a business be forced to lose money in their business and keep it open? The beach was infact kept open to the public under the new ownership, until the County ordered arbitrarily that it be open all of the time, and parking to be provided at 1970’s prices. Then it became necessary to get a legal interpretation of the law. The county had never demanded this of the old owners and the Coastal Commission had never required gate permits to change or repair gates in the past per the sworn testimony of the former owners. They locked and unlocked the gate when they wanted. A comparable private property located to the south,the Red White Blue beach, which operated the same way as Martins Beach as a toll access beach. It ceased paid for public parking access sometime in the late 1990’s and no action was ever taken by the County or the Coastal Commission to force it to open or to get permits for the change. Is that fairness? Fact: The beach in the early 1920’s extended far out but has all been eroded away and the property line is now submerged, eroded away by years of natural action by the oceans. No public beach, as defined under California law, exists. A large portion of the remaining beach is often steep with minimal space between the ocean and seawall; coupled with the dangerous undertow and rip tides that are present make it very dangerous. Judge Buchwald clearly ruled on this in the first court case. A portion of Martins Beach property is tidelands as defined by California law because erosion has done extensive damage over decades to what was the beach. Fact: Judge Buchwald (4/30/2014 Summary Judgment) stated: “court finds that defendant owns such property including submerged tideland and Plaintiff has no rights including but not limited to any right of public access or easement for the public to use or access the property for any purpose whatsoever. — Judge Buchwald stated he does not usually grant summary judgments. Citing from the hearing, the Judge explained that he rarely grants motions for summary judgment because they are usually unlikely to withstand appeal. He said he feels his opinion in this case would have a high likelihood of withstanding appeal. He said he believes the precedent we cited from the United States Supreme Court and the California Supreme Court is dispositive of the issues involved in the case. He said he believes that even if the case were to reach the United States Supreme Court, he thinks Friends of Martins Beach (FOMB) would be unlikely to get a different result. The Judge also commented that if there is no right of public access he believes Martins would have a right to close the beach and maintain security guards to keep trespassers off the property. He has also stated that there is no form of public easement under any theory for the public to use this road. — California law defines the legal description of what constitutes a public beach and the property at Martin’s beach, according to ruling by Judge Buchwald, owns lands to the submerged lands of the Pacific Ocean. The public does not have a right to be on the tidelands (based on the Court¹s ruling on the Summary Judgment). This is per State law. Fact: A permit for an emergency seawall was sought to save what was left of the lower road and the parking, but the delays in allowing prevention of erosion from the waves has caused it to vanish eliminating the land that was available for parking. Compared to 1958 today there is no parking left as illustrated below in the pictures that speak for themselves. An emergency permit was finally issued. At this point the cost of constructing and recovering the old parking areas is prohibitive. The property, according to former Parks & Recreation director was marketed to many parties. 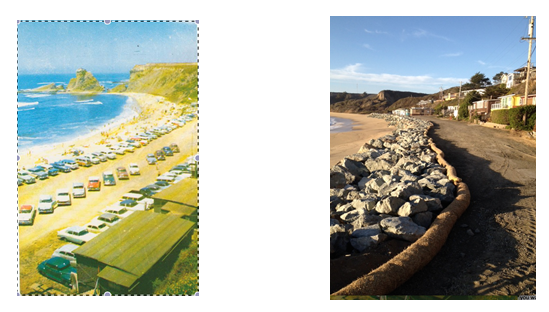 In approximately 2005 the State Department of Parks and Recreation Director explored acquiring Martin’s Beach to be “the northern California version of Crystal Cove.” At that time, the State Parks director went to the location and assigned a team to evaluate the property. Upon completion of their review, State Parks decided to pass on purchasing the property based on the geology, high property value, and associated costs to acquire, improve, maintain and operate. Mid-Peninsula Open Space District, Nature Conservancy, Trust for Public Land, and all other potential interested parties all passed due to price and other factors. In addition, the property was also offered to Joe Cotchett, the owner of many properties in San Mateo County, a property speculator, and ironically the attorney of record in this case, representing the Surf Rider Foundation. Joe Cotchett, as well, was not interested in the property at the time. The property was also featured with a prominent cover photograph on the front of the Real Estate section of the San Francisco Chronicle in approximately 2005. Martin’s Beach has long since washed away leaving only a row of rocks along the cabins with no parking lot or turnaround. Point 2: It is one of the most dangerous beaches on the coast with both an undertow and a rip tide. Point 3: If public access is forced there is no law to provide a manager, security, lifeguards, parking, restrooms, food and water, garbage service, picnic area, or restrictions to access like no camping, etc. Point 4: Liability for the chaos, injury or death in the surf, angry people stuck in a mass of cars, pollution and garbage will likely fall to the state and our tax money to clean up or pay for. Final Point: Martin’s Beach was my family beach for generations and I miss the place very much, but the fact is that the spots on the sand I recall are now under water along with the places I remember parking… it was the end of an era long ago which is why the former owner’s sold out after raising the ticket prices higher and higher for fewer and fewer parking spots until surf and landslide took it all away. And now some people are fighting over a ghost. The press has been quoting each other and fed by lies and innuendo by the opponents of Martin’s Beach who have been misreporting and over dramatizing the facts. No mention has ever been made of the fact that there was hardly any interest in visiting the property on a typical day. Even the New York Times dramatically states the owners “put up a forbidding gate” when infact no gate was put up, and it is a simple low slung gate”. They liberally quote the opponents without verifying the facts or the court rulings already on the record such as “I realize this is private property but the constitution requires that the public have access to the beach”. This is not true and Judge Buchwald was clear in his ruling on the constitutionality of private property. Often reporters have quoted each other without verifying the facts or doing their homework. Sensationalism not facts and “all the news we want to print, fit or not” seems to be the mantra, and we believe the public is being misinformed.